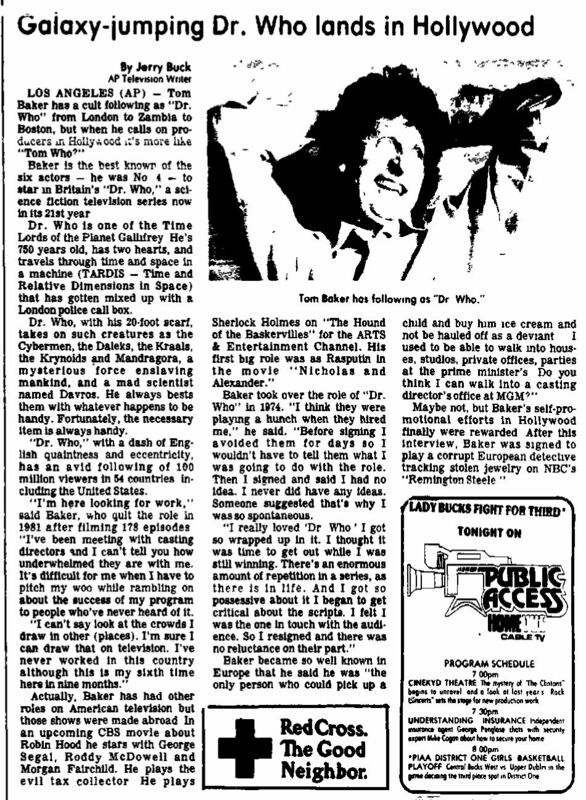 LOS ANGELES (AP) Tom Baker has a cult following as Dr. Who from London to Zambia to Boston, but when he calls on producers in Hollywood it's more like "Tom Who?" Baker is the best known of the six actors-- he was No. 4 — to star in Britain's Dr. Who, a science fiction television series now in its 21st year. Dr. Who is one or the Time Lords of the Planet Gallifrey. He's 750 years old, has two hearts, and travels through time and space in a machine (TARDIS —- Time and Relative Dimensions in Space) that has gotten mixed up with a London police call box. Dr. Who with his 20-foot scarf, takes on such creatures as the Cybermen, the Daleks, the Kraals, the Krynoids and Mandragora, a mysterious force enslaving mankind, and a mall scientist named Davros. He always bests them with whatever happens to be handy. Fortunately, the necessary item is always handy. Dr. Who, with a dash of English quaintness and eccentricity, has an avid following of 100 million viewers in 54 countries, including the United States. "I'm here looking for work." said Baker, who quit the role in 1981 after filming 178 episodes. "I've been meeting with casting directors and I can't tell you how underwhelmed they are with me. It's difficult for me when I have to pitch my woo while rambling on about the success of my program who've never heard of it. "I can't say look at the crowds I draw in other (places). I'm sure I can draw that on television. I've never worked in this country although this is my sixth time here in nine months." Actually, Baker has had other roles on American television but those shows were made abroad. In an upcoming CBS movie about Robin Hood he stars with George Segal and Morgan Fairchild. He plays the evil tax collector. He plays Sherlock Holmes on The Hound of the Baskervilles for the ARTS & Entertainment Channel. His first big role was as Rasputin in the movie Nicholas and Alexander. Baker took over the role of Dr. Who in 1974. "I think they were playing a hunch when they hired me," said. "Before signing I avoided them for days so I wouldn't have to tell them what I was going to do with the role. Then I signed and said I had no idea. I never did have any ideas. Someone suggested that's why I was so spontaneous. "I really loved Dr. Who. I got so wrapped up in it. I thought it was time to get out while I was still winning. There's an enormous amount of repetition in a series, as there is in life. And I got so possessive about it I began to get critical about the scripts. I felt I was the one in touch with the audience. So I resigned and there was no reluctance on their part." Baker became so well known in Europe that he said he was "the only person who could pick up a child and buy him ice cream and not be hauled off as a deviant I used to be able to walk into houses, studios, private offices, parties at the prime minister's Do you think I can walk into a casting director's office at MGM?" Maybe not, but Baker's self-promotional efforts in Hollywood finally were rewarded After this interview, Baker was signed to play a corrupt European detective tracking stolen jewelry on NBC's "Remington Steele." APA 6th ed. : Buck, Jerry (1984-03-13). Galaxy-jumping Dr. Who lands in Hollywood. The Daily Intelligencer p. 27. MLA 7th ed. : Buck, Jerry. "Galaxy-jumping Dr. Who lands in Hollywood." The Daily Intelligencer [add city] 1984-03-13, 27. Print. Turabian: Buck, Jerry. "Galaxy-jumping Dr. Who lands in Hollywood." The Daily Intelligencer, 1984-03-13, section, 27 edition. Title: Actor goes from Dr. Who to Tom Who? Title: Who is this Dr. Who? Title: Best Liked 'Dr. Who' little known in U.S. Title: Who is Tom Baker? Title: Cult star is asked: Dr. Who? Title: Tom Baker: Who is he? Title: In the U.S he's Tom Who? Title: Dr. Who has hard time finding work in U.S. Title: Best-Known 'Dr Who' seeking work in U.S. This page was last modified on 30 March 2019, at 04:28.